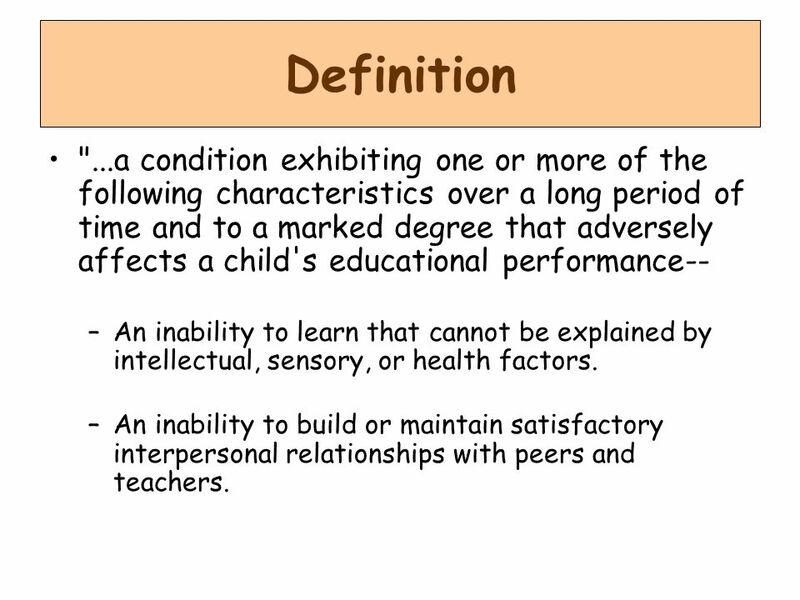 3 Definition "...a condition exhibiting one or more of the following characteristics over a long period of time and to a marked degree that adversely affects a child's educational performance-- An inability to learn that cannot be explained by intellectual, sensory, or health factors. An inability to build or maintain satisfactory interpersonal relationships with peers and teachers. This definition contains the criteria used for determination of eligibility. 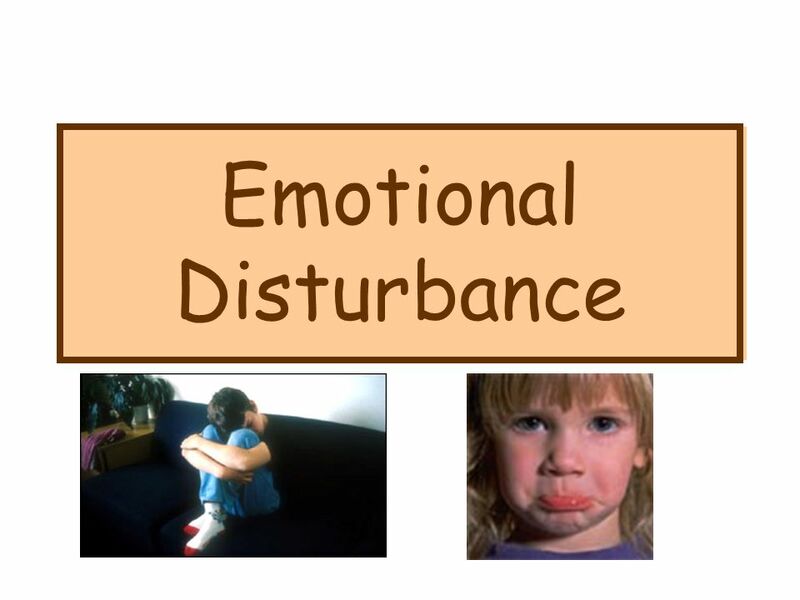 Social maladjustment Behavior in conflict with parent Behavior associated with a subculture and contrary to larger community mores Behavior which does not render student helpless, confused or disorientated Although social maladjustment may be associated with emotional disturbance, it is not sufficient to make a student eligible as emotionally disturbed. 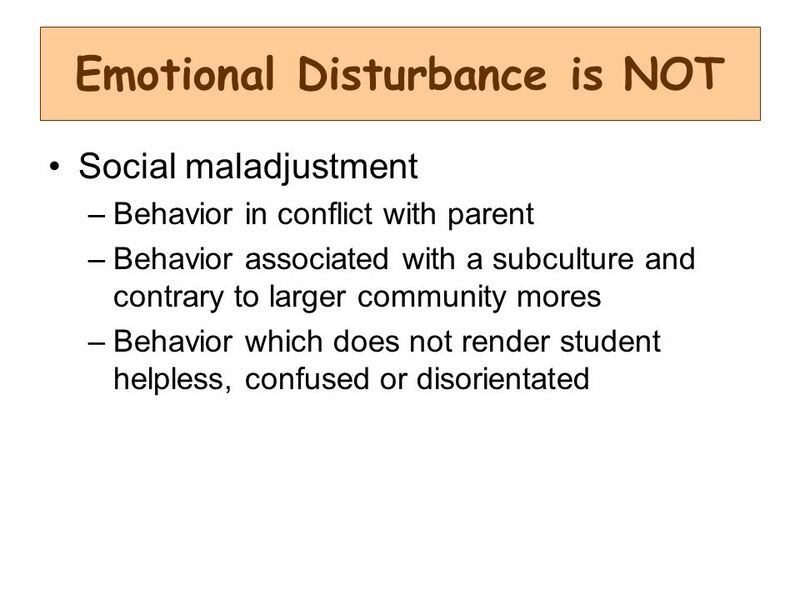 A student with social maladjustment is likely to benefit from a behavior support plan. 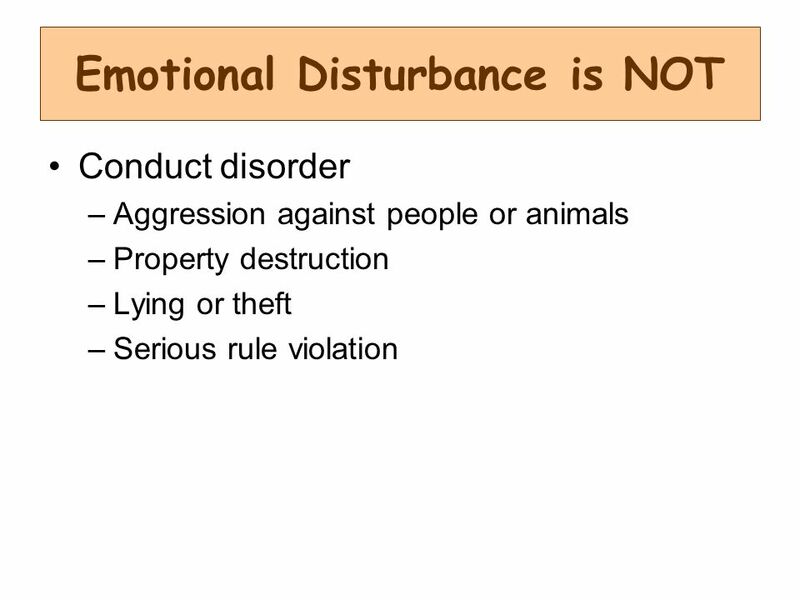 Conduct disorder Aggression against people or animals Property destruction Lying or theft Serious rule violation Again, a conduct disorder is not sufficient to make a student eligible as a student with emotional disturbance. 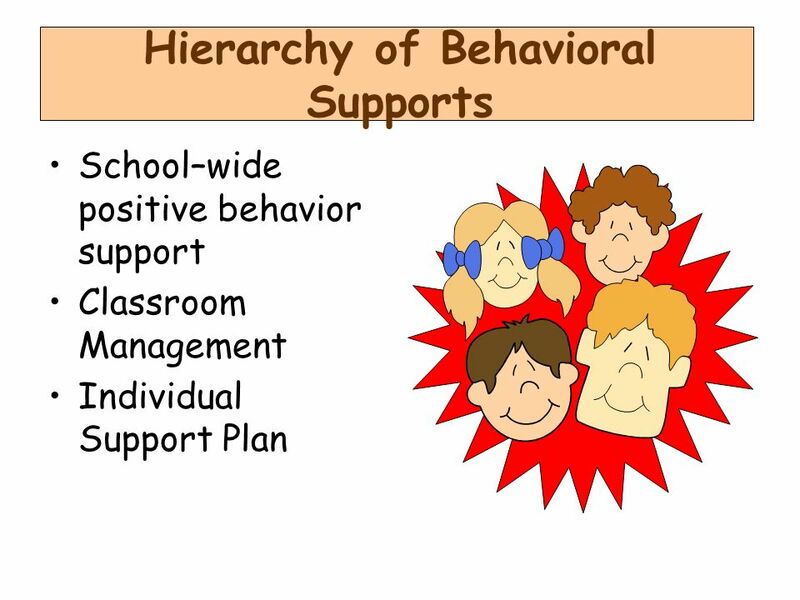 A student with a conduct disorder would likely benefit from a behavior support plan. 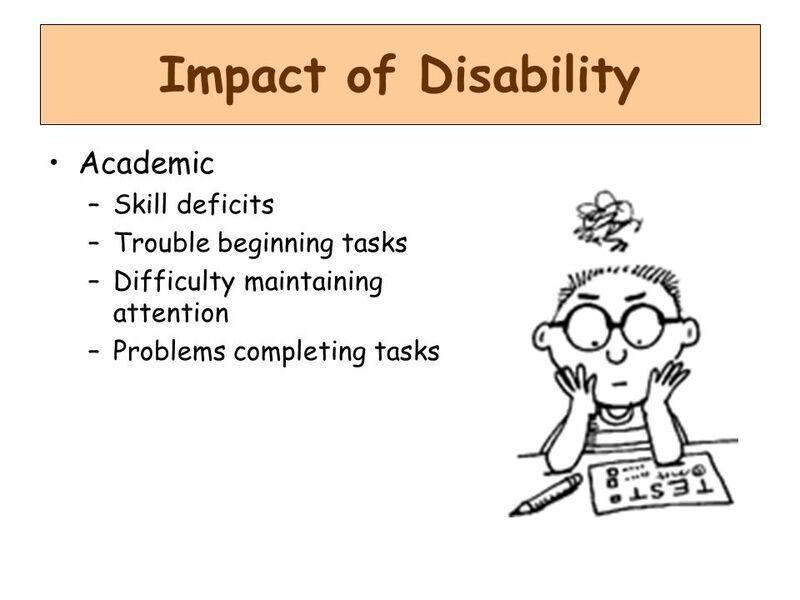 Difficulty maintaining attention Problems completing tasks Students with emotional disturbance can be easily frustrated by the demands of the academic task and will often need additional encouragement to complete assignments. Aggression Defiance Disruption Fighting Internalizing - Withdrawing Isolation Self abuse Depression Anxiety Interaction with others (making and keeping friends) Coping strategies Reading social cues Students with an emotional disturbance can manifest that disturbance in a variety of ways and in a variety of circumstances. 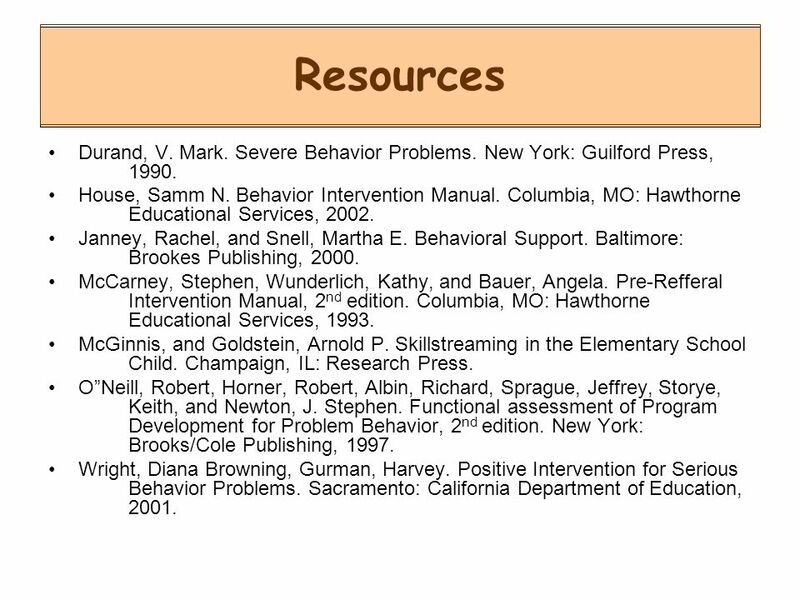 In terms of behavior these three headings describe the ways in which the student demonstrates behavior. 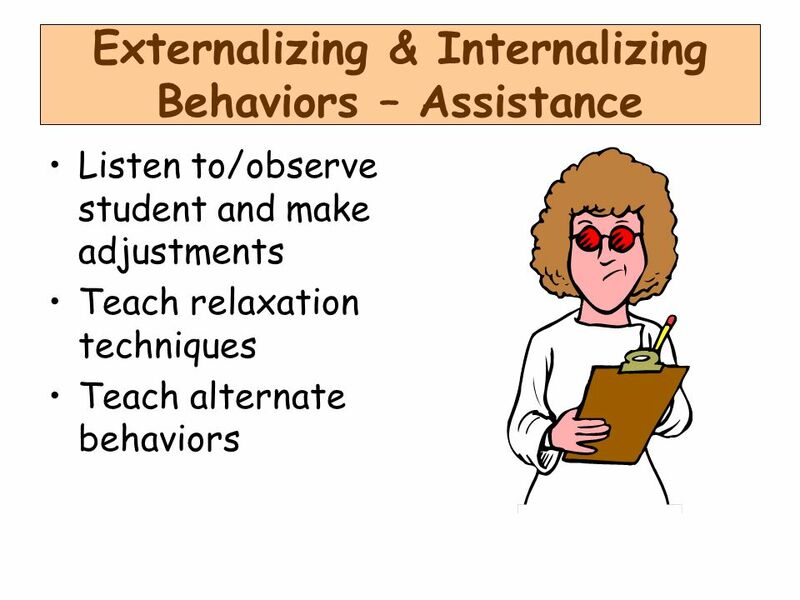 Listen to/observe student and make adjustments Teach relaxation techniques Teach alternate behaviors It is important to collect data on the student’s behavior in order to have objective information on which to based decisions. 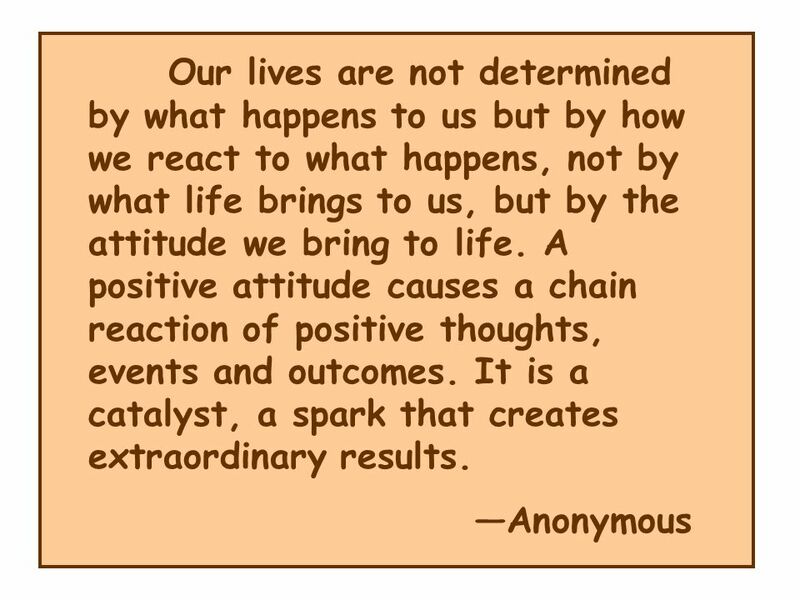 Rather than rely on impressions which can be colored by emotional responses, one needs to look carefully at the context in which the behavior occurs. 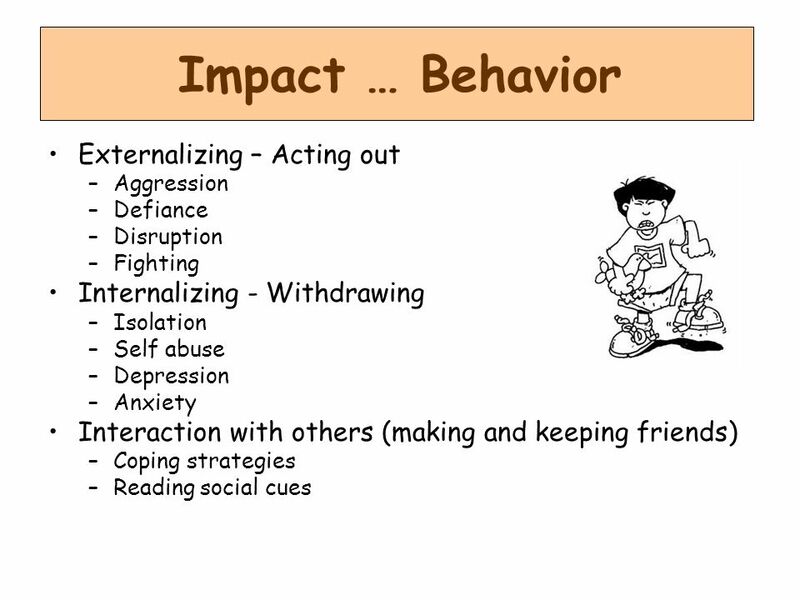 By observing the student throughout the day one can often determine what issues seem to be affecting the student’s behavior. 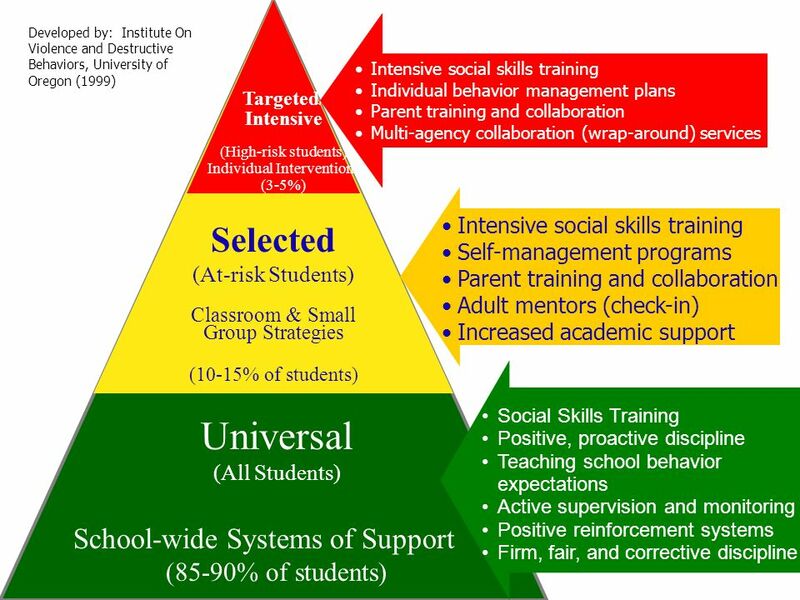 Teach social skills proactively Break skills down into parts Teach, model, practice and reinforce skills Teach self-regulating skills Students with emotional disturbance do not pick up on social skills without direct, explicit instruction. The instruction needs to occur in context so that it is meaningful. For example knowing how to form a line is as important as knowing when to form a line. 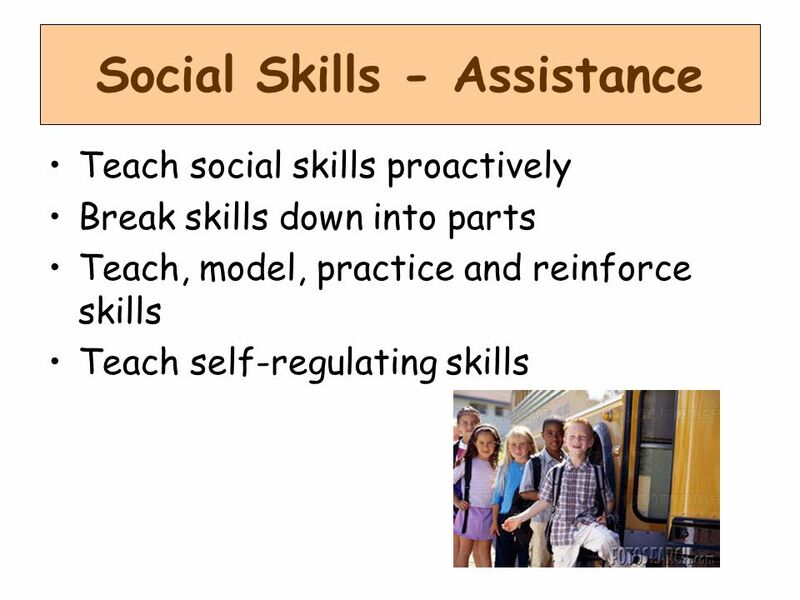 Teach social skills through multiple examples, frequent practice opportunities, provide feedback and monitor for success. 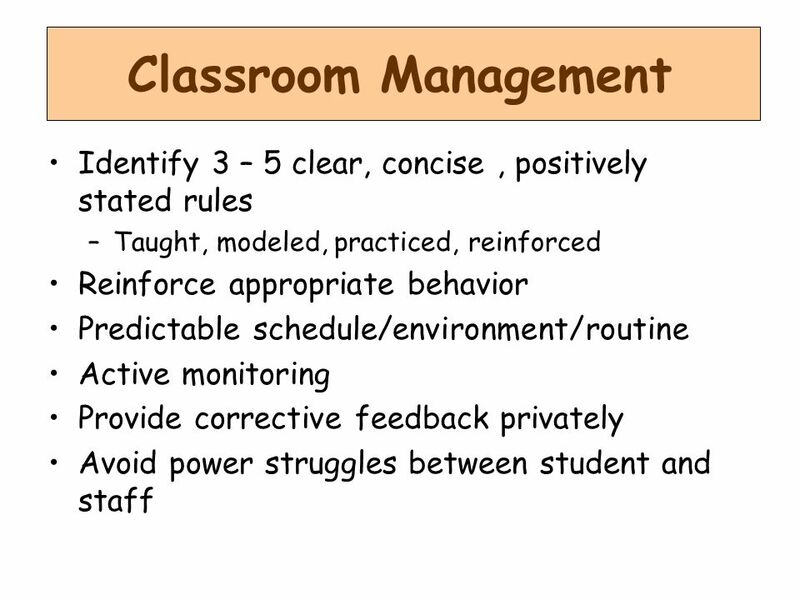 15 Classroom Management Identify 3 – 5 clear, concise , positively stated rules Taught, modeled, practiced, reinforced Reinforce appropriate behavior Predictable schedule/environment/routine Active monitoring Provide corrective feedback privately Avoid power struggles between student and staff Effective classroom management can eliminate many inappropriate behaviors. Students can participate in identifying or developing the classroom rules. The rules must be taught and reinforced in a consistent manner. When students know what the classroom schedule/routine is and how transitions between activities are managed, many inappropriate behaviors are eliminated. 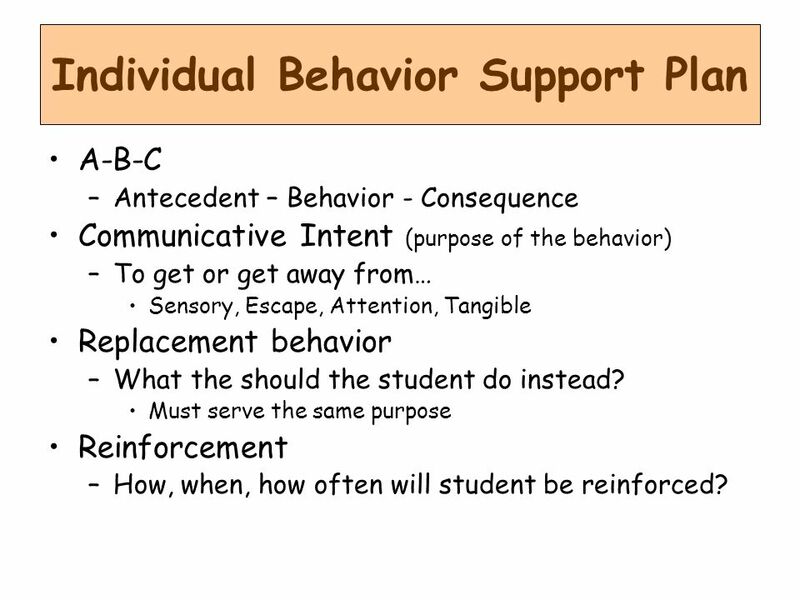 A-B-C Antecedent – Behavior - Consequence Communicative Intent (purpose of the behavior) To get or get away from… Sensory, Escape, Attention, Tangible Replacement behavior What the should the student do instead? 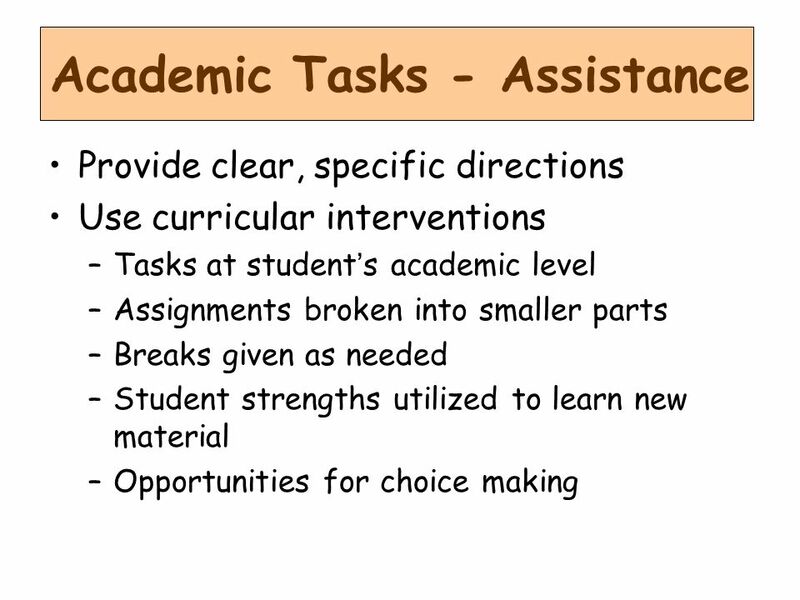 Must serve the same purpose Reinforcement How, when, how often will student be reinforced? All behavior has a cycle of antecedent (what happened before the behavior), behavior and consequence (what happened after the behavior) The purpose of the behavior is to get or avoid sensory, escape, attention or something tangible. In order to replace a behavior you must teach a replacement behavior that achieves the same purpose as the behavior you are trying to change or eliminate. 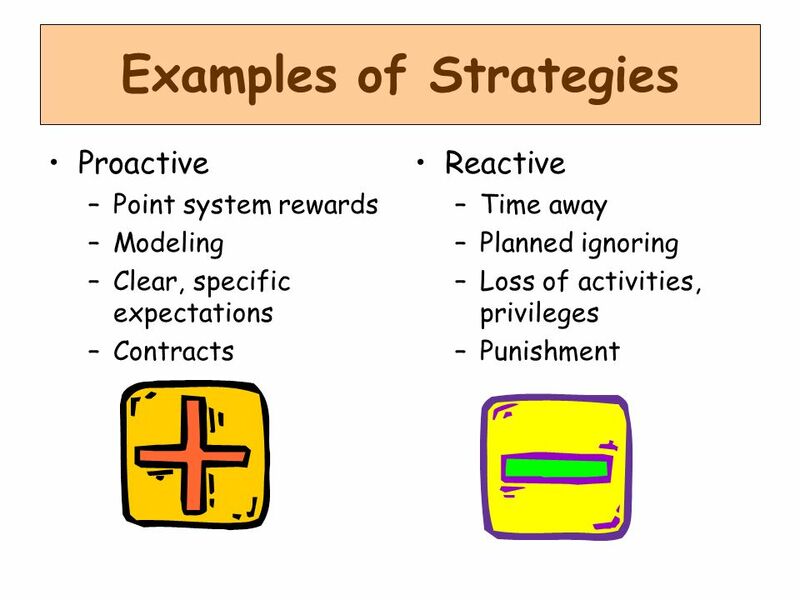 Planned reinforcement is necessary to ensure that the behavior is learned and maintained. 19 How Can Support Be Provided? 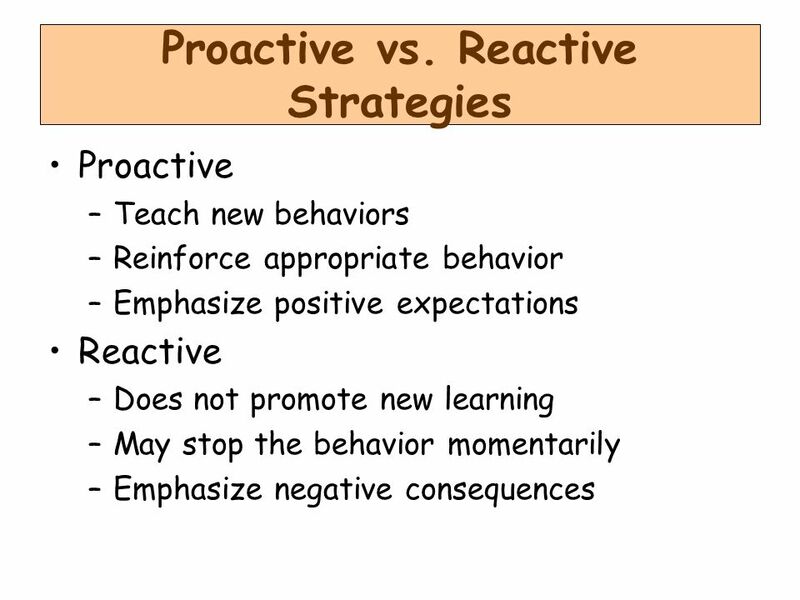 1 Promoting Positive Behavior in Learners Through the Modification of Instructional Antecedents John J. Wheeler, Ph.D. Richard S. Bumbalough Tennessee. Los Angeles Unified School District Division of Special Education Schools for All Children Developmental and Learning Characteristics of Students with. Serving Emotionally Disturbed Students Dickey LaMoure Special Education Unit. 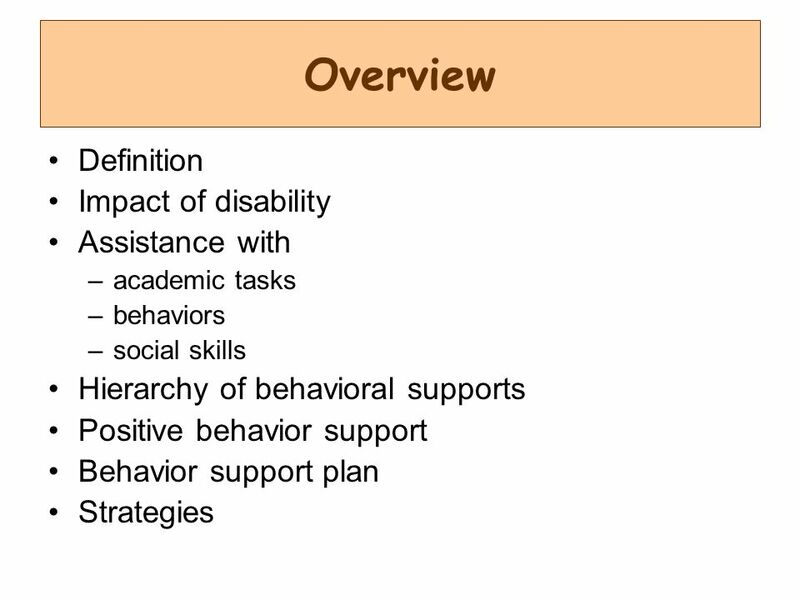 UNDERSTANDING BEHAVIOR Presented by: Kelly Wilson University of Colorado at Denver Pyramid Plus Team. Emotional and Behavioral Disabilities By Gillian Lachanski, Anikka Martin, Deborah White, Mike Valeski. 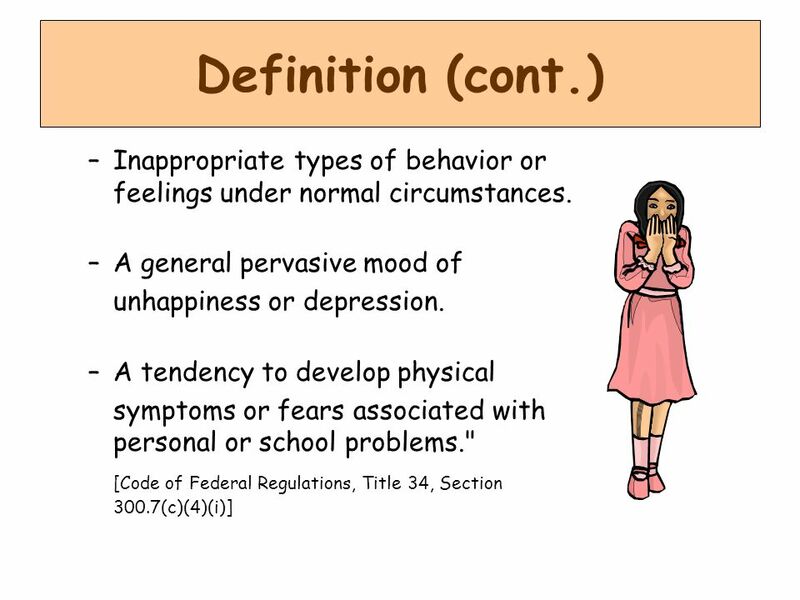 Emotional and Behavioral Disorders ESE 380 February 19, 2009.